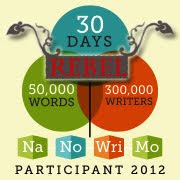 November is National Novel Writing Month and the goal is 50,000 words, but just like last year, I plan on being a NaNo rebel yet again. Last year, I started on a book on church history and I do plan on finishing. Someday. This year, the cat is out of the bag. Look, on thing that gets on my nerves about egalitarians is that we have all of these critiques we level at complementarians, but guess who has all of the resources? Yup, it’s the comps! So, for this November, I hope to work everyday (in addition to working 7 days a week, and blogging) on a curriculum, tentatively entitled, “Together Forever: A Christian Curriculum for Singles, Relationships, and Marriage.” I have already gotten great feedback from one Facebook group. So, I am open. What questions and/or problems need to be addressed in a text like this? This entry was posted in Political Jesus and tagged male bias, masculinity, NaNoWriMo, relationships, sexism, sexuality, writing on November 2, 2013 by Rod T.
I Joined #NaNOWrimo This Year: As a #NaNoRebel for Church History! In case you hadn’t noticed a new logo on the side bar of this site, I have decided to do National Novel Writing Month this year, as NaNoRebel of course in Political Jesus fashion. National Novel Writing Month is a group of people dedicated to writing a fiction novel of 50,000 words or more for the month of November. Taking a break from being a pop culturalist, I wanted to get back to my first love, Church History, and try do a possible book accessible for laypersons, but at the same time, challenge the way church history is being done. Right now, I am challenging the idea that church history starts with the Jewish and Christian split in the first century, as if Gentiles and Jews don’t have a back-story or context. I promise to keep you all updated. What would you look for in a church history book? This entry was posted in Political Jesus and tagged Church history, historical theology, Nano Rebels, NaNoWriMo, Political Jesus, writing on November 6, 2012 by Rod T.